37mins: Another free-kick to the home side. Lallana takes it while Henderson makes a run down the right before passing to the midfielder. But as Henderson touches the ball, Gradel collides with him - and the home crowd shout for a penalty. It's not given, though, and rightly so. 41mins: Lallana whips in a corner kick but no one can connect with it. Four minutes left of this first half and it's still 1-0 to Liverpool. Cameras showing Liverpool owner John W Henry and his wife in the stands. The pair had earlier in the day checked on the progress of the Main Stand, which is currently being expanded. 44mins: Chance! Clyne plays a ball into Coutinho's path, but the Brazilian drives his low shot wide. 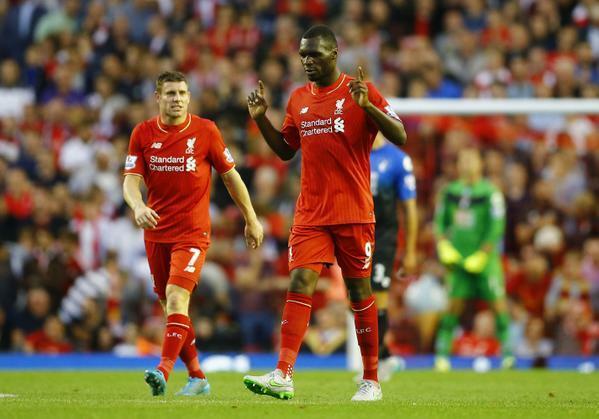 HT: Liverpool 1-0 Bournemouth (Benteke). So Bournemouth had an early goal ruled out before Benteke scored his first goal for the Reds even though there will be debate about whether it should have stood with Coutinho appearing to be offside. We have kick off in this second half. Let's see if Bournemouth can get themselves back into the game. 47mins: The visitors have a shot on target after Ritchie takes a long-range effort at goal, but the winger's shot is easily saved by Mignolet. 49mins: Ritchie works the ball well down the right, cuts in and drives a curling effort at goal. His shot, though, goes wide. 51mins: Emre Can is coming on, presumably, to provide extra protection for the defence as Henderson makes way for the Germany U21 international. 54mins: Can goes down under a rash tackle from King as the forward went for the ball. He's back up, though. 54mins: Liverpool are looking good here in this second half and after Benteke won the ball off Elphick, his pass to Ibe allowed the full-back to cross for Milner. The midfielder drives his shot just wide. 60mins: Close! Bournemouth have a great chance to restore parity after Daniels squares the ball across the penalty area for Ritchie, who fires his shot at the post. 60mins: Howe brings off King for Lee Tomlin, who makes his debut in the Premier League - as well as for Bournemouth tonight. 63mins: O'Kane shoots at the side netting after some nice work from Wilson on the edge of the area. 67mins: Liverpool have a free-kick just outside the area after the ball comes off Daniels' arm. 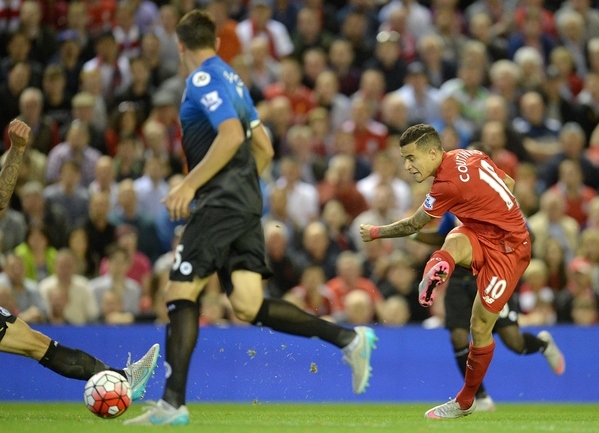 Coutinho takes the set-piece, but his shot rebounds off the wall. Roberto Firmino, who had a good 15 minutes or so against Stoke last week, is preparing to come on. 69mins: Ibe comes off for Firmino. 73mins: Liverpool go on the counter and Benteke, on the left, takes his time to find Coutinho down the middle but the Brazilians shot is superbly cleared by Daniels. 74mins: Gomez is shown a yellow card. 77mins: Substitute Tomlin is given a yellow for his challenge on Lallana. 80mins: Howe brings off Gradel for Adam Smith. 80mins: And now Coutinho is making way for Alberto Moreno. The Brazilian has had a fantastic game, although he couldn't get on the scoresheet. He was clearly Liverpool's most creative player tonight. 84mins: Bournemouth take a corner kick and Tomlin gets his head to the ball, which goes just over the bar. 86mins: Dan Gosling is being introduced for O'Kane. 88mins: Bournemouth are looking for the equaliser but, so far, Mignolet has dealt with any danger comfortably. 1-0 to Liverpool with two minutes to plus added time. 89mins: Close! Benteke nearly makes it 2-0 to the home side but hits the bar. Clyne delivers a ball from the right and finds Benteke, but the striker drives his shot onto the bar before Lallana's follow-up goes high. 91mins: Cook is shown a yellow for bringing down Moreno as he goes on a fine run. Liverpool get a free-kick in a dangerous area, which Milner drives well wide. That was a wasted chance. And that's it! Liverpool make it two wins from two after Benteke's first-half strike secures a 1-0 win over Bournemouth. Questions will certainly be asked of the goal while Bournemouth saw a goal ruled out earlier on. Liverpool move up to third in the table while Bournemouth have now lost their opening two matches in the Premier League. 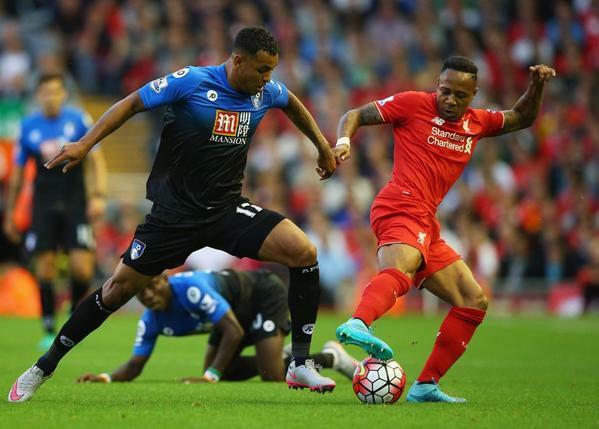 Check out our player ratings from Liverpool's win over Bournemouth, here. Elsewhere, Bournemouth centre-back Tommy Elphick has labelled Benteke's goal as a "gut-wrencher" and insisted it should not have stood. Read his and Rodgers' take on the controversial strike, here. That's us done from the Liverpool v Bournemouth game. Thank you for following our live blog - we hope you enjoyed it!